Radiologists are looking ahead to using Y90 in other areas of the body. Since its introduction in 2000, radioembolization with yttrium-90 (Y90) has become the go-to treatment for liver cancer, especially for those patients whose tumors are not operable and who no longer respond to chemotherapy or other systemic therapies. 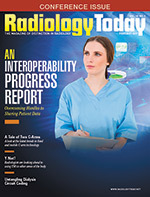 "Y90 radioembolization is well established in all types of liver cancers, primary or metastatic," says Riad Salem, MD, FSIR, a professor of radiology, medicine, and surgery, and chief of the division of interventional radiology in the department of radiology at Northwestern University in Chicago. Radioembolization is a treatment in which microscopic, radioactive beads are injected into the blood vessels of tumors; the beads kill the tumors from within. When treating liver cancer, radioembolization with Y90 has several advantages over other treatments. "We are able to deliver hundreds of times more radiation in one shot through a small microcatheter than radiation oncologists do in weeks of treatment," Salem says. Radioembolization is also a very focused treatment, which limits the radiation dose to just the tumor and the immediate surrounding tissue, says Yong C. Bradley, MD, a professor in the department of radiology at the University of Tennessee Graduate School of Medicine in Knoxville. "Perhaps that's why it is such an interesting method of treating tumors," Bradley says. In addition, the outpatient therapy seems to be extremely well tolerated, which is another huge advantage, says William S. Rilling, MD, FSIR, a professor of radiology and surgery and vice chair of clinical affairs in the division of vascular and interventional radiology at the Medical College of Wisconsin in Milwaukee. While the liver is "where it's at for this therapy," Rilling says researchers are starting to think about applications for treatment outside the liver. Advances in IR and nuclear medicine could make Y90 radioembolization safe and effective to treat sites other than the liver in the future, Rilling says. Among the sites under consideration are the brain, kidney, and prostate. Some research also is under way using Y90 radioembolization to treat diseases and conditions other than cancer. Current treatment options for brain tumors are not highly effective, Salem says. "We are limited in how much radiation we can give the head and the skull," he says. The blood supply to brain tumors is very rich, however, which could make them good candidates for radioembolization, he adds. Radioembolization with Y90 may be a good option because "it is technically straightforward to get a catheter up into a brain tumor," Salem says. Researchers have also talked about potentially treating meningiomas, tumors that form in the membranes that surround the brain and spinal cord, with radioembolization, Rilling says. The reason meningiomas are an "interesting possibility" is that they have a blood supply "that is separate from anything else that likely would have a lot of bad effects from the radiation." Rilling is not aware of any clinical work on radioembolization of meningioma with Y90, but it would be on his list of five places outside the liver "where you start to think about doing some studies to see if it's safe and effective," he says. Renal cell carcinoma is another possible target. Renal cell carcinoma is the third most common cancer of the urinary tract and predominantly affects children and young adults. Surgery is the mainstay of treatment for localized renal cell carcinoma, but some trials are under way to determine whether radioembolization with Y90 would be a better or alternative treatment, Salem says. Researchers at Northwestern University reported some success treating renal cell carcinomas with radioembolization with Y90 in the Journal of Vascular and Interventional Radiology in February 2013. "Kidney tumors in general are very vascular," Salem says. "That's why they could be amenable to Y90." The more vascular the tumor, the more beads will get concentrated in the tumor, and the better the effect, he says. There has also been some preliminary talk about using radioembolization with Y90 to treat prostate cancer. "This is an extension of treatment where we would go into the prostate and embolize it with bland particles," Salem says. He adds, however, that he would be somewhat hesitant to use radioactive beads because the blood supply to the prostate is quite complicated "and any nontarget deposition from radioactive beads is not likely to be as well-tolerated as bland beads." The radiation particles would need to go to the prostate and nowhere else, and that could be challenging, he says. Rilling is also skeptical of a role for Y90 radioembolization in the prostate, but two studies presented at the European Association of Urology in March 2015 showed prostate artery embolization to be a safe and effective alternative to more traditional treatments for benign prostatic hyperplasia. "There are patients whose symptoms improved after prostate embolization," Rilling says. However, he agrees that the complex anatomy of the region makes the prostate an unlikely candidate for the treatment. "The risk/benefit is not going to be that good," he says. "If you get a couple of embolization particles outside the target when doing embolization, the toxicity may be too great." Radioembolization with Y90 is now widely accepted as a treatment for liver metastases from colorectal cancer. In the United States, colorectal cancer is the third leading cause of cancer death among men and women. An aggressive disease, colorectal cancer metastasizes to the liver in about one-half of all patients. Now, researchers are looking at using the interventional oncology procedure to treat metastatic disease to the liver from other primary tumors including breast, neuroendocrine, and uveal melanoma. A study published in the Annals of Surgical Oncology in April 2014 of 40 patients in Australia found that radioembolization with Y90 was safe and effective for the treatment for their unresectable, chemo-resistant breast cancer liver metastases. Research looking at whether radioembolization increases survival for patients with neuroendocrine tumors is ongoing; 40% to 90% of patients with neuroendocrine tumors have liver metastases at the time of diagnosis. While surgery is the definitive treatment for these tumors, many patients have large or multiple lesions that make resection difficult. In patients with uveal melanomas, liver failure is the primary cause of death. These patients are usually not good candidates for resection and some small studies are looking at whether radioembolization of their liver tumors could increase their survival. Because cancer drugs and other treatments have greatly improved in recent years, many cancer patients are living longer, Salem says. "Their primary cancer may be controlled but now they have metastases in patterns that we've never seen before," he says. "So we're confronted with new problems." If radioembolization with Y90 can prove beneficial for these types of metastases, it could be extremely helpful, he says. Robert J. Lewandowski, MD, FSIR, director of interventional oncology at Northwestern Memorial Hospital, says radioembolization with Y90 also has a role in treating patients with unresectable cholangiocarcinoma (bile duct cancer), a primary liver cancer much less common than hepatocellular cancer. "There is compelling evidence in the literature supporting radioembolization for patients with mass-forming cholangiocarcinoma confined to the liver," Lewandowski says. Y90 radioembolization could potentially have a role in converting liver cancers from unresectable to resectable, Salem says. One option for the treatment of liver cancer is a liver transplant. However, far more patients need liver transplants than there are livers, he says. "So we need to figure out ways to make people who are unresectable resectable and cure them without a transplant." One possibility is with a radiation lobectomy, Salem says. "Radiation lobectomy means taking advantage of Y90 to treat the tumor and hypertrophy of what remains of the liver after resection. Our tools to make that happen in the past have been limited, but Y90 has changed that paradigm completely. We now are able to potentially resect and cure people that four months before were told, 'You're unresectable and incurable. That's all there is.' This is very, very exciting." A preliminary study published in the Journal of Surgical Oncology in July 2016 found that radiation lobectomy was a safe and effective method to achieve remnant liver cell enlargement while providing tumor control. Radioembolization with Y90 may also have a role in noncancer treatments. Salem and his colleagues recently started an industry-sponsored trial of radioembolization to treat enlarged spleens. "People with chronic liver disease often develop large spleens from portal hypertension," he says, adding that enlarged spleens cause low platelet counts, which can lead to any of a number of downstream health effects. One way to deal with the problem is to try to kill part of the spleen by scarring it with radiation. "If I can radiate part of the spleen and scar it down, it will metabolize fewer platelets, and the patient's platelet count will increase," Salem says. The study was approved in November 2016 and is currently enrolling patients. On a different front, Bradley and colleagues are looking at Y90 radioembolization to treat obesity. They published a paper in the Journal of Vascular and Interventional Radiology in October 2016 about their study, in which they embolized the left gastric artery in six pigs with Y90. "We injected the radioisotope particles in the part of the stomach that has ghrelin-producing cells," Bradley says. Ghrelin is the "hunger hormone"; produced in the cells that line the stomach, it stimulates appetite. A little more than two months later, the researchers saw that the treated animals gained less weight than those that had not been treated. They concluded that the procedure has promise, but more research is needed. Some have expressed concern that radioisotope particles in the stomach could lead to complications such as ulcers or gastritis. However, Bradley believes the answer lies in the dosimetry. "It's like a lot of things that we use," Bradley says. "It depends upon how much or how strong or how we use it to treat different diseases." The interventional oncologists who were interviewed for this article agree that more research is needed to determine not only which patients could benefit from radioembolization with Y90 but also when in their disease course to apply this therapy. One barrier to better understanding these concepts is that prospective clinical trials are expensive to run, Lewandowski says. Two companies currently manufacture the microscopic beads that contain Y90: Sirtex Medical manufactures SIR-Spheres, which are polymer or resin beads, and BTG International Ltd manufactures TheraSphere, which are glass beads. "Both companies deserve significant credit for their roles in sponsoring large, prospective randomized trials that should help produce the data necessary to support the use of this promising therapy in more patients," Lewandowski says. If these studies are positive, they will provide interventional oncologists with the ability to promote radioembolization with Y90 on oncology treatment guidelines, at local tumor boards, and with insurance carriers, he says. "Most people look at radioembolization and think only about treating liver cancers because that's where most of the research has been," Bradley says. "But I believe, in the future, we will be able to branch out to different areas." — Beth W. Orenstein, a freelance medical writer who lives in Northampton, Pennsylvania, is a regular contributor to Radiology Today.